There's no denying it, low flying is seriously fun! But the lower you fly, the riskier it gets. No matter what you do, low flying will always be more dangerous than flying high, but there are ways of making it safer, and keeping the risks to a minimum. In this post we'll look at the things you should always do when flying low, and the things to avoid. We'll look at the risks and the dangers you may encounter, and I'll share everything I've learned from countless hours spent flying below 50 feet. So what are we classing as low flying in this post? Here in the UK we have the 500 ft rule, where we can only fly below 500 ft if there are no people, vessels, vehicles, or structures. So most UK pilots class anything below 500 ft as low flying. But I'm talking lower than this, in this post we'll focus on flying below 100 ft. 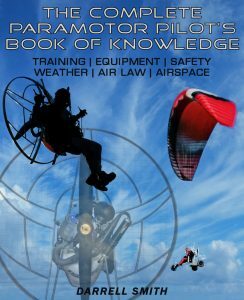 If you're new to paramotoring then flying low may sound very appealing, but you'll need to get to know exactly how the paramotor and wing behave before venturing down low. Practice tight turns with power on and off, and get to know how much altitude you loose while turning, and how much power is required to maintain a constant altitude while in a steep turn. I recommend you get at least 20 hours of flight time before flying low, but not just straight and level flight. 20 hours of active flying in different weather conditions, and getting to know how the wing reacts to power changes, and different amounts of brake input. Power lines and wire fences have caused many paramotor accidents, as they can be extremely difficult to spot until it's too late. You'll need to run a full reconnaissance of the area from 100 feet above before dropping down low. Check for power lines, but bare in mind that the poles aren't always visible. Wires are very hard to spot if there are no poles, so circle the area checking from all angles, and keep a look out for poles that are hidden by trees or tall hedgerows. Wire fences are very hard to see from above, but they don't usually create such a problem as power lines. A good blast of power along with brake input is usually enough to lift you clear of fences, but you'll still need to be very vigilant. Cows, sheep, and horses can get very freaked out by paramotors. If you see any animals below, it's best to avoid flying low. The last thing you want to do is scare the animals or annoy the farmers, this will put you and the sport in a bad light. Avoid flying close to people, and keep an eye out for birds. I once saw a video of an eagle flying into a paraglider, the wing collapsed and the pilot had to throw his reserve. Engine failures can happen at any time, and with plenty of altitude you'll have lots of time to plan your landing. If you're flying ten feet above the ground you'll need to react immediately. This is why you should always fly directly into the wind if you are any lower than 50 feet. If you're flying downwind, your ground speed will be very fast, and this could end with a nasty landing. You should also keep your speed low by keeping your trimmers closed at all times while flying low. Even if you've checked for power lines and fences from above, you still need to remain very vigilant at all times. I mentioned how hard it can be to spot power lines from above, and pilots have collided with them after thinking it was all clear. So always look ahead, and never take your eyes off your forthcoming flight path. Pilots who look down at cameras, or instruments are at a much higher risk, so switch off all instruments before dropping below 100 feet. I good climb rate is essential if you wish to fly low. 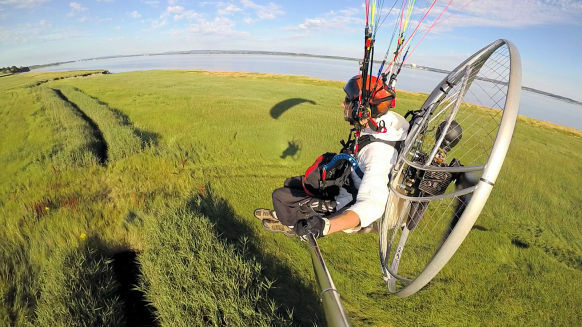 An under-powered paramotor will be very slow to climb, and obstacles will present a serious hazard. 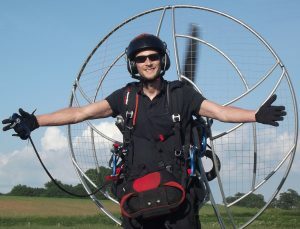 I wrote about a problem I had with an under-powered paramotor in my training post HERE. I very nearly ended up in a hedge, and if it wasn't for my instructors clear instructions over the radio, I'm sure I would have crashed. Be sure that you have enough power to climb to avoid obstacles, and make sure your engine reacts instantly as the throttle is opened. Flying low over water is very risky, but it can be made a little safer with a specially designed paramotor flotation device. You'll also need to follow a few other important rules that you can read about in THIS POST. When you're flying low you're more likely to encounter turbulent air, this could be rotor, thermals, or unstable air resulting from nearby hills, and undesirable terrain etc. If the air feels turbulent as you descend, it's best to climb out of it and leave the low level for another day, or try a different location. When you fly in turbulence you risk wing malfunctions, and at such a low level your wing may not have time to recover. You should also bare in mind that if your wing became unrecoverable, your reserve probably won't have enough time to open at these altitudes. If you decide to stay in the same area, and fly a few circuits of a field for example, you'll need to be aware of your prop wash. As you fly through the air, wake turbulence forms behind you. Wake turbulence refers to the disturbance of the air, so it could be caused by the propeller, paramotor, or the wing. The first time I experienced flying through my own wake was, it hit me so hard that it lifted me out of the harness, and twisted me 90 degrees. Until this happened I had no idea how powerful it could be, nor how dangerous. Since this I've always been fully aware of my exact flight path, and I will not pass through the same area twice within the space of about 60 seconds. Although wake turbulence can hang around for longer than this, I've always found that after 60 seconds it isn't strong enough to cause any problems. I recently watched a video of a pilot who flew through his friends wake about 10 seconds after his friend had passed over. The pilots wing folded and he was so low that it didn't recover, and he hit the ground. So remember this, and be aware of wake turbulence at all times, from your own paramotor and from other aircraft. When you start flying low you'll soon be tempted to give foot dragging a try. This is a skill that needs to be developed and practised a lot, and throttle control is super important. When foot dragging, or simply flying close to the surface, it's important to develop throttle control, and to minimize your brake input. If you use the brakes to slow you down, and to increase lift, you may not be able to climb quick enough if you need to. Remember that the propeller takes a moment to spin up, and you may need to pull some brake to give you a quick increase in lift that you need before the power is available. If you already have the brakes half pulled during a foot drag, the wing will not have enough speed or energy to create the lift you need. So keep your hands up as far as possible, only using the brakes when absolutely necessary, and work on improving your throttle control at every opportunity. By following these tips, low flying will be much safer, but remember that there is always more risk involved the lower you get. Start slowly by reducing your altitude a little more each flight, and never attempt any steep manoeuvres while you're low.